Forgotten Tech With Intel's 'Tolapai' system-on-a-chip (SoC) part making headlines this week, it's worth remembering this embedded part isn't Intel's first highly-integrated processor. 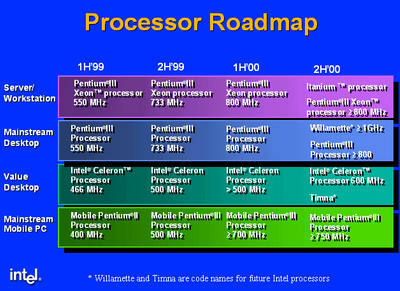 Ironically, the core Tolapai is said to be based on, the Pentium M, may have been instrumental in the demise of 'Timna', the chip giant's first major SoC project. Timna emerged in March 1999 when 3D graphics chip specialist S3 - later acquired by VIA but then independent - hinted it was working on a SoC part with Intel. The chip would contain S3's Savage 4 GPU, the company suggested. Three months later, the rumour mill was discussing Timna's Pentium II-class processing core, 128KB of L2 cache, integrated South Bridge and Rambus RDRAM memory controller. Not long after, it was said to be clocked at 533-700MHz and be fabbed at 180nm. The chip would be offered in a 370-pin package. A reference motherboard designed for the part was apparently codenamed 'Arago'. Around this time, a number of chip makers, most notably National Semiconductor were looking to a future of ultra low-cost PCs given away by service providers to encourage World+Dog to start using the internet. Earlier, Intel acquired Chips & Technologies, ostensibly to boost its own SoC expertise, and it's possible Timna was a result of that purchase. The chip itself was developed by Intel's design team in Haifa, Israel. That didn't stop Samsung saying early in 2000 that it was planning a sub-$200 PC which, while not explicitly stated as being based on Timna, was nonetheless said by the company to have a feature set like that of the Intel SoC. Samsung was eyeing a Christmas 2001 launch, well over a year after the mid-2000 launch date being associated with Timna at the time. By the time Samsung's system was due, the internet bubble had burst.